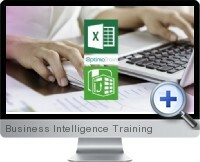 Business intelligence training for Excel 2013 and above combines example files and comprehensive video tutorials to use PowerPivot and BI tools for big data science and analysis. The self-paced training provides lifetime access to all materials and covers all aspects of using advanced business intelligence tools in Excel on external big data sources for powerful business reporting. Materiel covers all aspects of PowerPivot to extract insights from data including connecting to data sources, OLAP, DAX language, hierarchies and charting tools. Download example files for PowerPivot and advanced BI tools work. Importing and connecting to external data sources for data mining tasks. Relational database logic for defining hierarchies for BI analysis. Learn concepts OLAP cubes, SQL querying and Microsoft Query. Covers all aspects of PowerPivot from sourcing data, perming analysis and creating reports. In-depth topics for leveraging DAX language, functions and measures to calculate data dynamics. Using cube functions, hierarchies and relationship tools to isolate data trends and metrics. Calculated fields and KPIs for defining customized calculations for reporting. Using the Data Model interface and other BI tools in Excel PowerPivot.